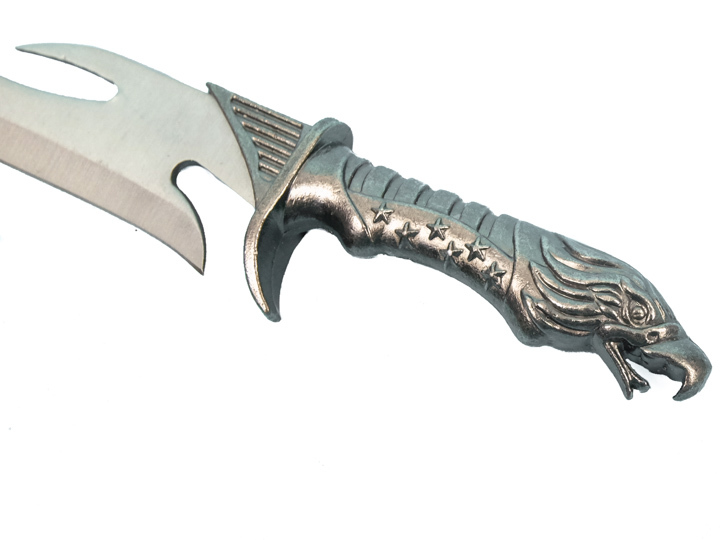 These novelty knives are ideal birthday, wedding, and Father's Day gifts. 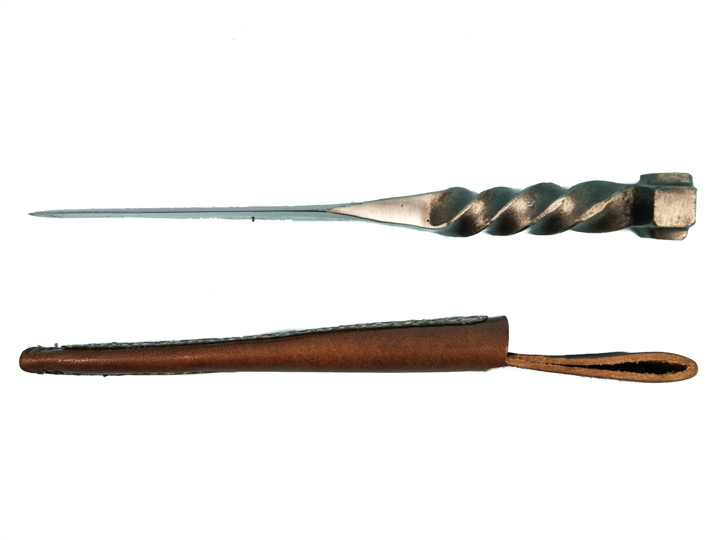 They are functional, but are meant to be collectors' items. 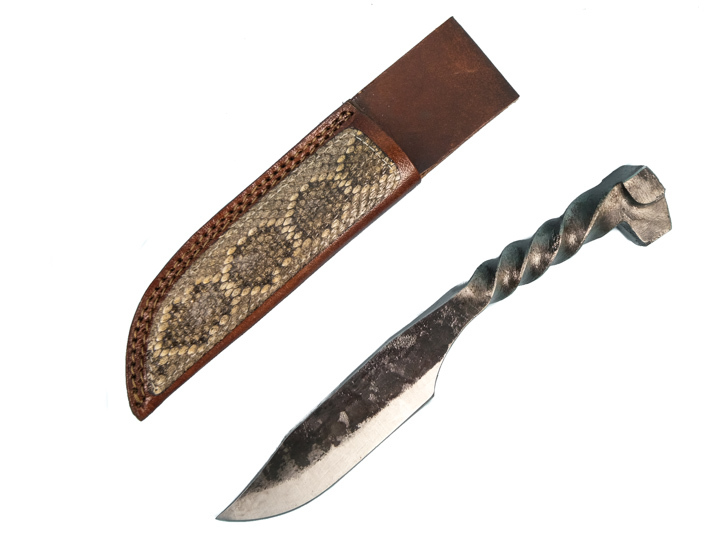 One style is a stainless steel railroad spike knife with a twisted handle and a sheath with a genuine rattlesnake skin sewn on the front. The knife measures 9.25" long (including handle) and 1.25" wide, while the sheath measures 8.5” long and 1.75" wide. 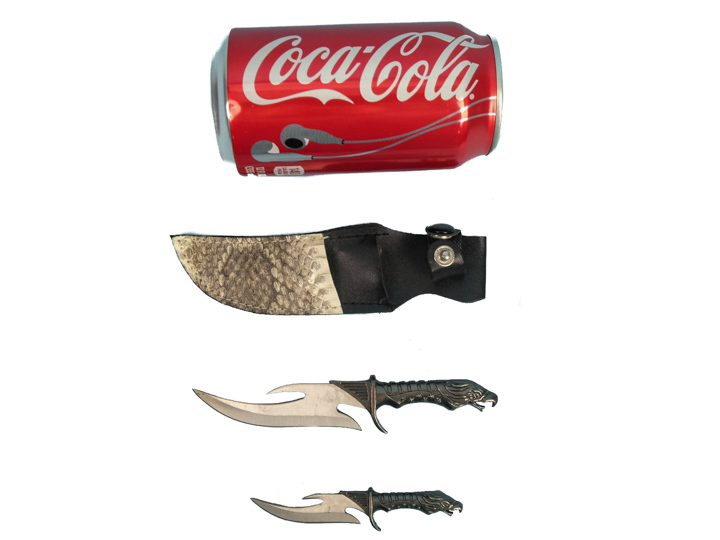 It weighs a total of 360 grams. 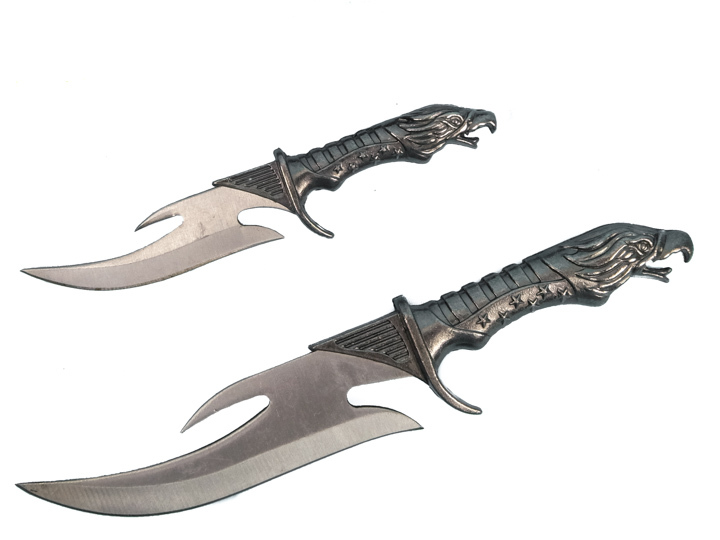 Another style is a set of stainless steel knives with ornately carved falcon head handles. 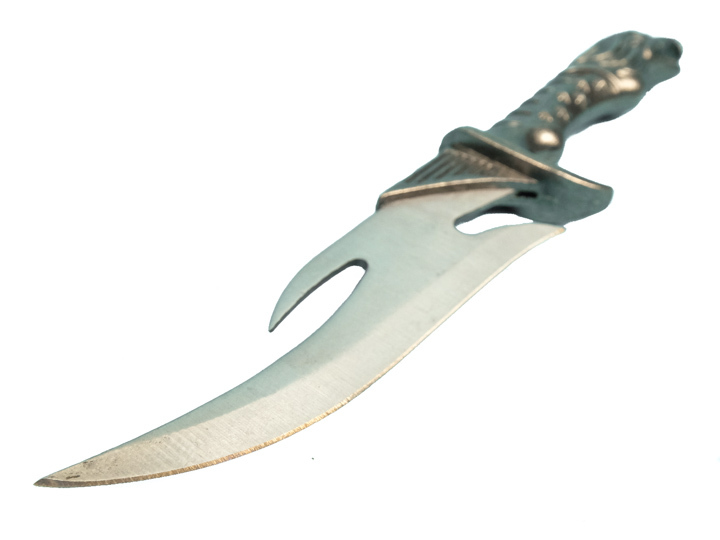 The blades are curved and shaped in a unique way. 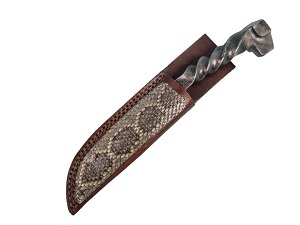 The sheath is made of synthetic leather with real rattlesnake trim. 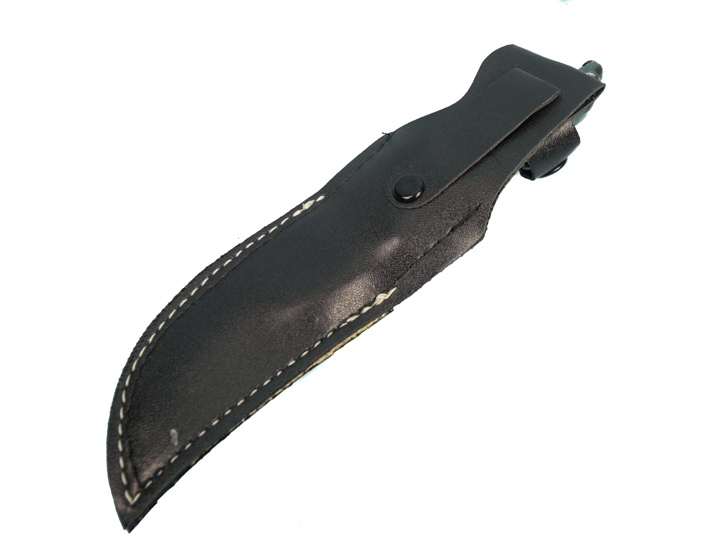 The large knife measures 6" long (including handle) and 0.75" wide; the small knife measures 4" long (including handle) and 0.5" wide; and the sheath measures 6” long and 1.5" wide. 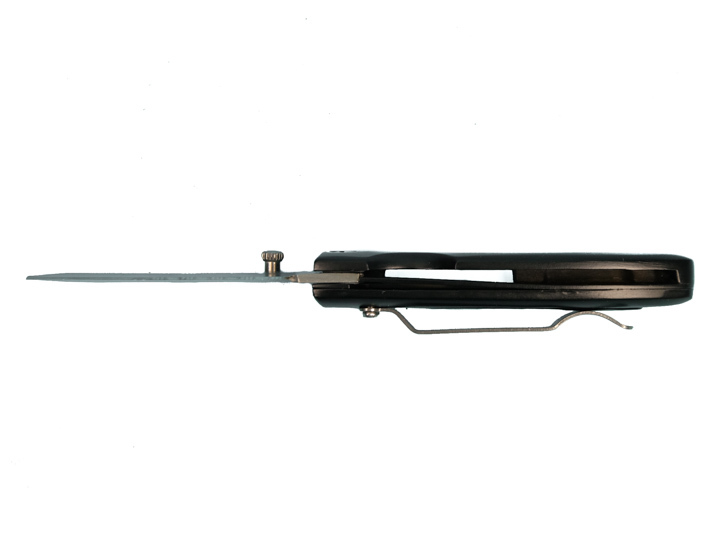 It weighs a total of 90 grams. 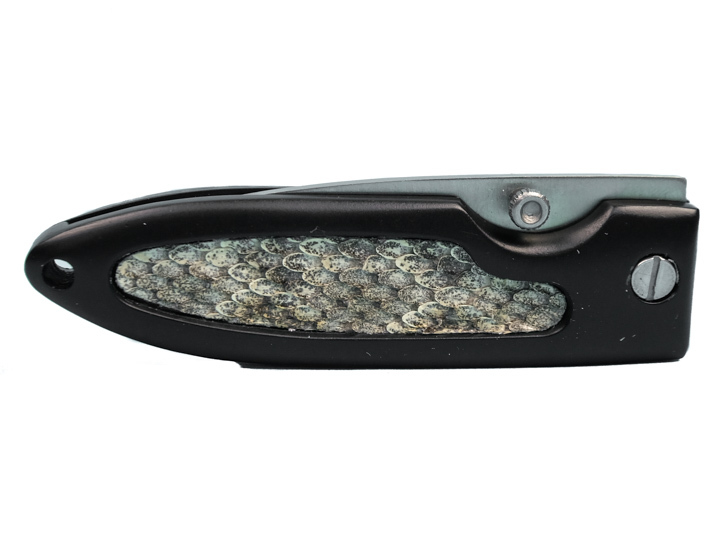 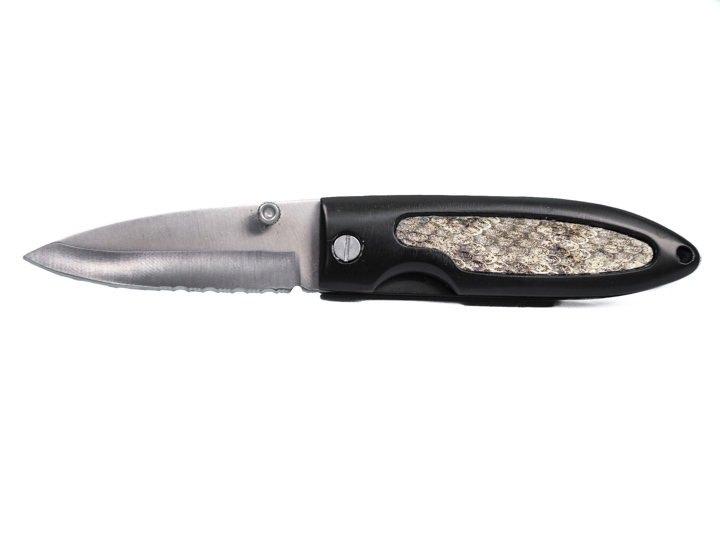 The stainless steel pocketknife comes with a genuine rattlesnake skin inlay on the handle and a spring-assisted opening for the blade. 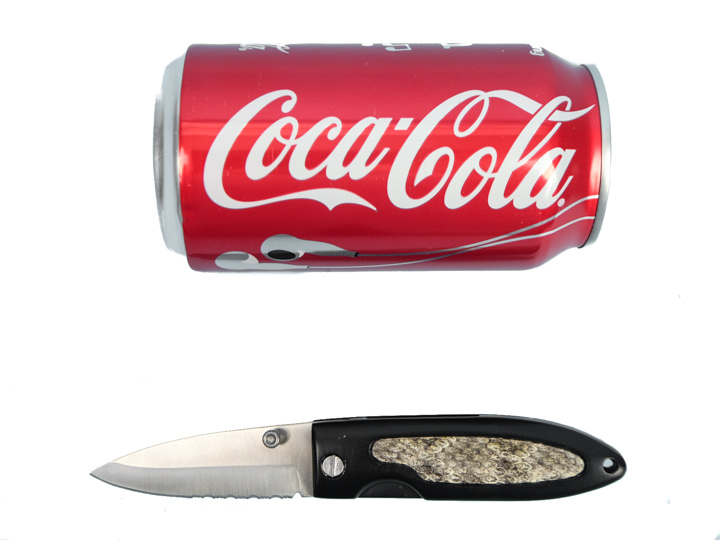 It comes with a belt clip on the back. 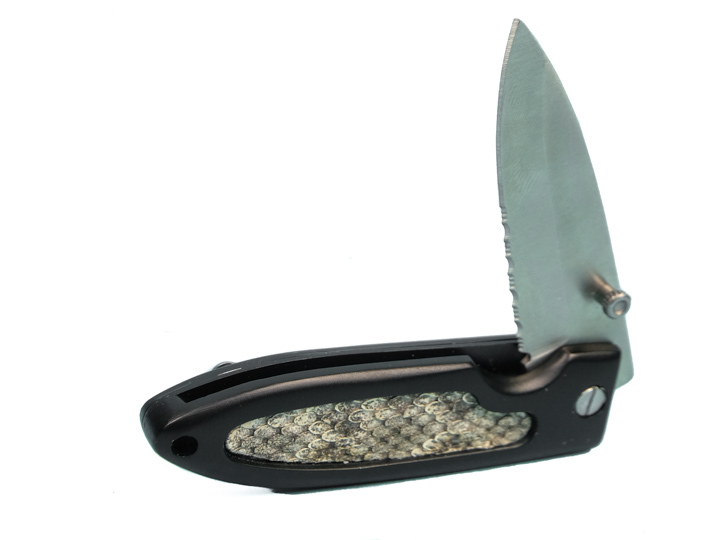 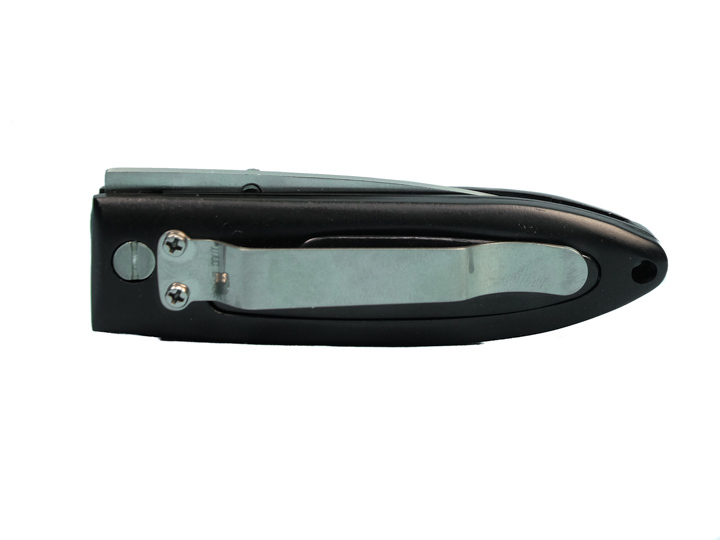 The pocketknife measures 3.5" long when retracted, and 6.25" long when opened. 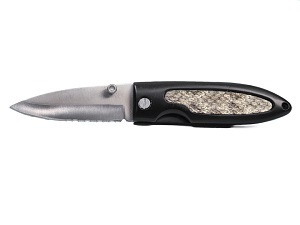 The width of the blade is 0.75" and the pocketknife weighs a total of 74 grams. 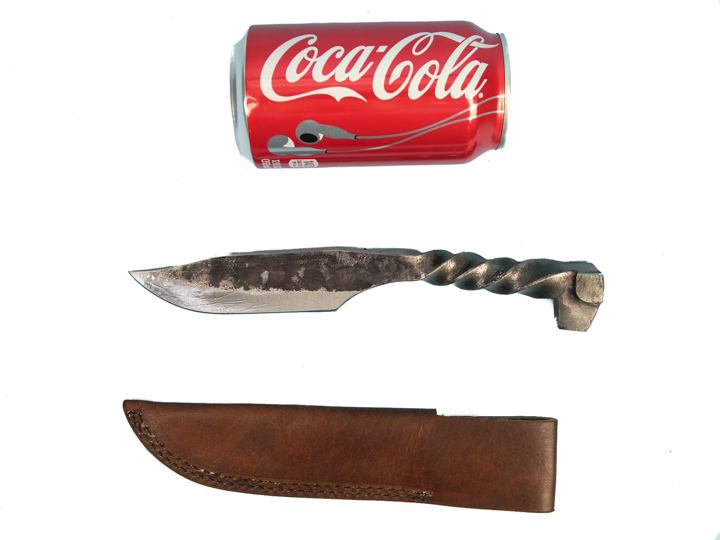 PLEASE HANDLE WITH CARE. 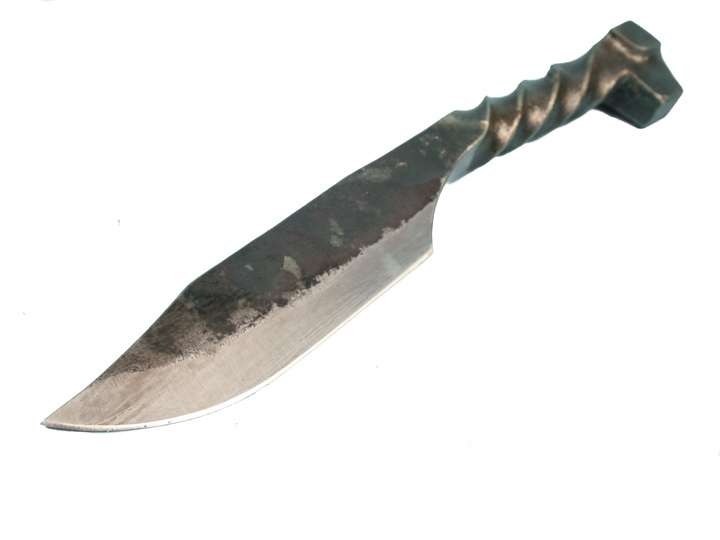 These knives come sharp. 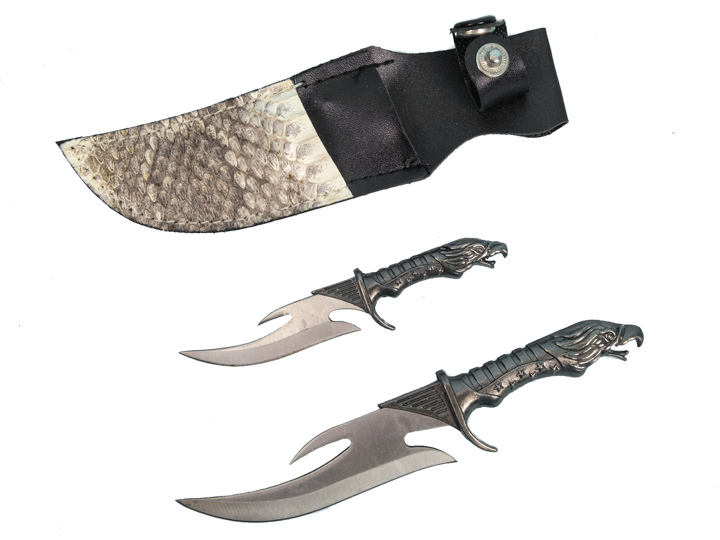 See the knife and the sheath separately, the knife alone, and a side view of both. 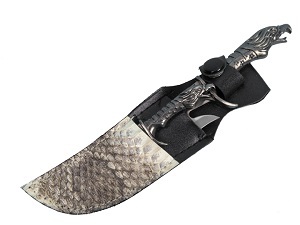 See the knives and the sheath separately, a close up of one knife, the two knives alone, a close up of the handle, and the back view of the sheath.